A super short guide to quickly setting up a viable python environment. This writeup is primarily for the students of PHYS3080 at UQ, however it should be generally applicable. Firstly, let’s get the obvious out of the way. It’s 2018. Python 2.7 is dead. Long live Python 3! Install it just for you, put it in some convenient location, and register Anaconda as the default. If you want Anaconda to be everywhere and never worry about starting it yourself, also add it to your path. It has the potential to confuse your computer if you have other previous python installations, so keep that in mind. So install it, and yay, you’re essentially done. If you’ve downloaded miniconda instead of Anaconda, you won’t have a few useful addons, like Spyder. If that’s the case, open an anaconda prompt window (it should be installed now) and type pip install spyder. If you can’t find anaconda prompt, you can also do this with a terminal / command prompt window, you just might need to navigate to your install directory’s Scripts folders. For me, this would be C:\Anaconda3\Scripts. If you need any dependencies or libraries in the future, this is the way to get them. pip install <name>, like pip install numpy. If it doesn’t work, try conda install <name>. Here’s what it looks like for me when I install the package chainconsumer. For your installations, there might be a lot more text. Don’t worry about it, unless it fails, it’ll also be installing dependencies. Right, so we should now be good to go. 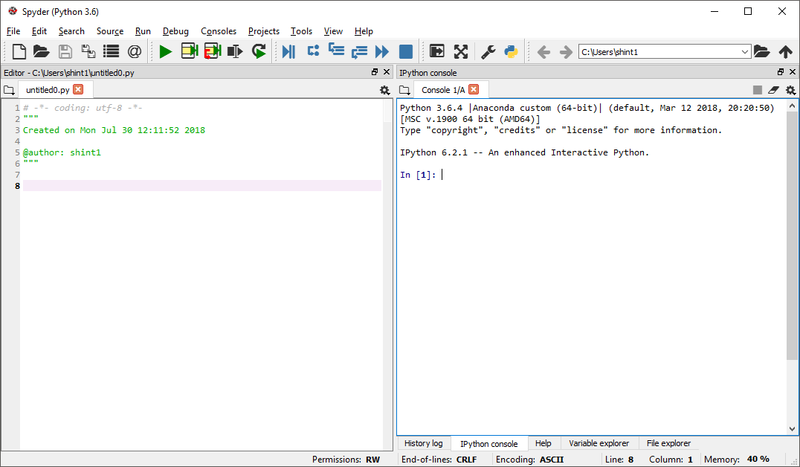 You can verify this by running Anaconda Prompt and typing python -V to get the version of installed python. You should see a python 3 anaconda version pop up. Anaconda, at the moment, comes bundled with a handy piece of software called Spyder. 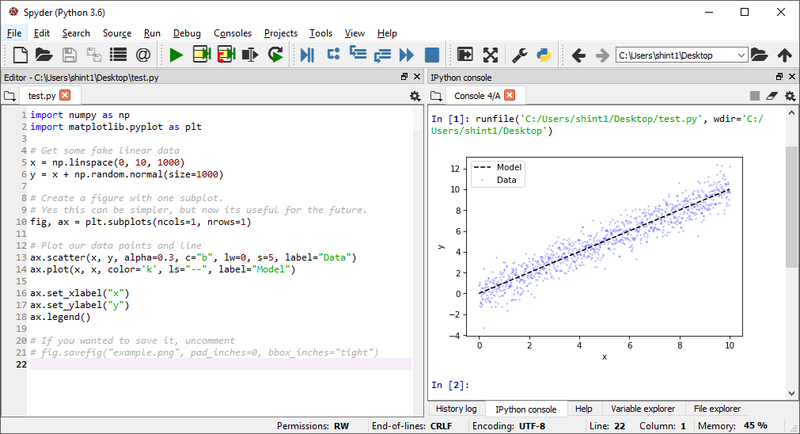 It allows you to write code and execute it on an iPython console (which is a normal python console with extra fun features like being able to embed figures inside it). So, open up Spyder. Hopefully it’s installed as an application, if not, you can launch it manually inside your anaconda installation. For me to do this, I would run the executable at C:\Anaconda3\Scripts\spyder.exe. On other systems, you might launch Spyder with a shell file or similar. 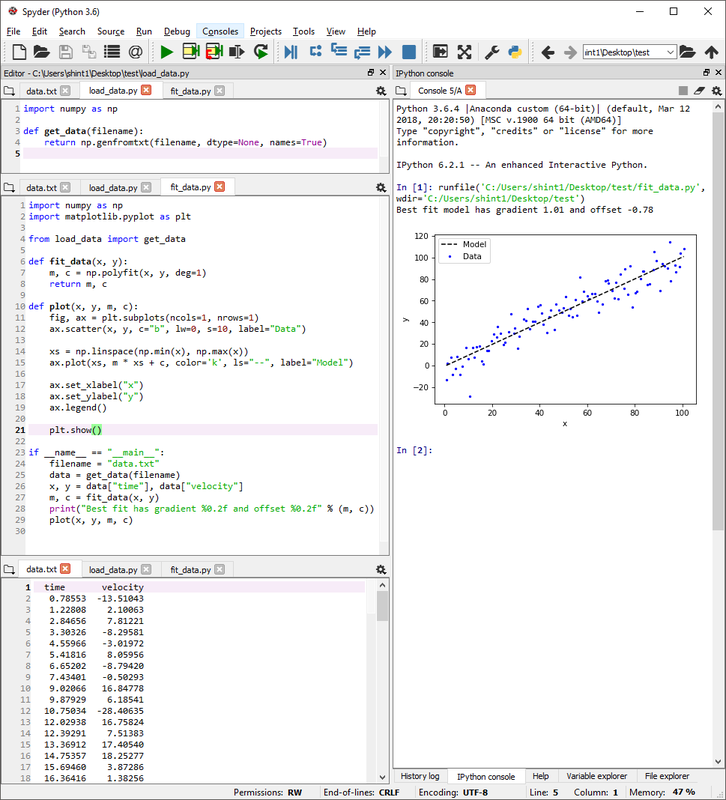 Just to verify you have the basic packages, let’s do some plotting with matplotlib and numpy. I’m deliberately adding extra options with the plotting so that you can see how to easily change things like the colour, size, line width, line style, etc. Feel free to delete all these options, the code will still work. # Create a figure with one subplot. # Yes this can be simpler, but now its useful for the future. So thats Spyder. Other alternatives are Jupyter Notebooks, or - for a more heavyweight solution, PyCharm. Use whichever you want, though for astrphysics courses you probably don’t need to spend much time worrying. No one likes huge files overflowing with a hundred functions and thousands of lines of code. So here is a quick example on how to call functions from other files. You can see that to import a function from load_data.py all we do inside fit_data.py is write from <filename> import <function>. I’ve also included some basic code useful for loading data files with columns which might come in handy. Also, note that now we have multiple files it is useful to break what you are doing down into functions, and have a main function, which in python is defined by if __name__ == "__main__":. This is useful because that if statement only gets executed if you run that file. Code not in that if statement will be executed if you try and import it. You can try this - add a print("hello") command to load_data.py without the if statement and you’ll see it print out when you import it. If I’ve left something out, please let me know, but hopefully you’re now good to go with a light-weight scientific python environment.